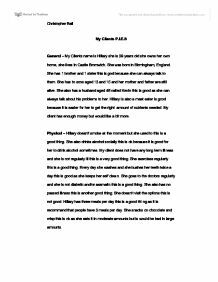 General – My Clients name is Hillary she is 39 years old she owns her own home, she lives in Castle Bromwich. She was born in Birmingham, England. She has 1 brother and 1 sister this is god because she can always talk to them. She has to sons aged 13 and 15 and her mother and father are still alive. She also has a husband aged 46 called Kevin this is good as she can always talk about his problems to her. Hillary is also a meat eater is good because it is easier for her to get the right amount of nutrients needed. My client has enough money but would like a bit more. Physical – Hillary doesn’t smoke at the moment but she used to this is a good thing. She also drinks alcohol socially this is ok because it is good for her to drink alcohol sometimes. My client does not have any long term illness and she is not regularly ill this is a very good thing. She exercises regularly this is a good thing. Every day she washes and she bushes her teeth twice a day this is good as she keeps her self clean. She goes to the doctors regularly and she is not diabetic and/or assmatic this is a good thing. She also has no passed illness this is another good thing. She doesn’t visit the options this is not good. Hillary has three meals per day this is a good thing as it is recommend that people have 3 meals per day. She snacks on chocolate and crisp this is ok as she eats it in moderate amounts but is would be bad in large amounts. Intellectual – Hillary as some qualifications this is good because this means she can have a good job which means she has enough money to have the thing she wants; this is very good. My client has some hobbies and would feels that she would like move. Hillary feels that her job is challenging this is good sometimes as is sometimes makes her stressed; being stressed it not a good thing. She also likes to do puzzles this is good as it keeps her mind active. Emotional – Hillary is made happy by being with her friends and her family. Most of the time Hillary is not stressed or worried. She sometimes feels that work causes her stress. Also my client feels that if she needs help in her life she has her husband to talk to. Her husband is there for her to rely upon and to tell her problems to. She feels that she has long relationship this is a good thing. Most of the time she know how other feels this is good. She feels that she is content with her life at the moment this is a good thing. Social – Hillary thinks that she has enough friends; this is good because she has people to talk to and tell her problems to. She also thinks that it is important to have friends this is also good. She has a few best friends this is good as she has people to talk to and always have some one to talk to. My client also gets on well with her family this is another good factor of Hillary’s life. Hillary has a good social life as she has a lot of friends at work; she also goes out with her friends from work this is good as she has a social life a work. Hillary feels that she goes out with her enough and doesn’t need to go out any more; this is good as she still goes out sometimes. Hillary feels that nothing stops her having a social life this is also very good. Hillary can also afford to go out and meet new people. This is a fair essay that looks at discussing PIES of a client. It could be enhanced by trying to discuss things in a little greater depth. The writer should try to explain what the effects are or the consequences if they have negative effects. Needs in relation to life stages Human have similar needs however needs are very even though at every single stage of life we have the same needs, (as shown in Maslow?s hierarchy). In order to develop positively, the way we fulfil these needs vary according to age. What is your marital status? Single 2. Why are you at this state? Because me and my boyfriend didn?t get along very well, so we decided to not live together 3. Do you have a pet? No 4. If yes, what is it and how long have you had it for? Abuse might happen because the care worker might lose their temper or patience with one of the clients or because of discrimination or prejudice due to certain groups or individuals being different from the abuser, it is a clients right for the care workers to treat them right and have someone stop it if it does happen. Food, warmth and protection from carers. Learning through playing. Formal education. Very reliant on carers for emotional support and as models for beliefs. Developing circle of friends. Greater range of social contact. Adolescent(10-18) Physical, Intellectual, Emotional, Social Rapid growth and puberty linked to taking more personal needs. Because MS is a very progressive disease needs assessments need to be carried out on a regular basis because the symptoms and effect it has on the physical body can change very fast.